People process loads of information on the web every day, and this, of course, affects how they expect news website designs to behave. 94% of people cited web design as the reason they mistrusted or rejected a website. Good news website designs that accommodates a lot of content is a tricky balancing act to pull off. Get it wrong and you risk overwhelming your visitors, who’ll then leave without retaining any part of what they just read. Get it right and you’ll have gained a new audience member or maybe a few more. Although, content is still king, mobile, responsive, faster, and darker websites have the advantage. Plugins, compression, and other methods to increase page speed are mandatory to lower bounce rates and improve conversions. So what are online news website designs all about? How do they influence user interaction? 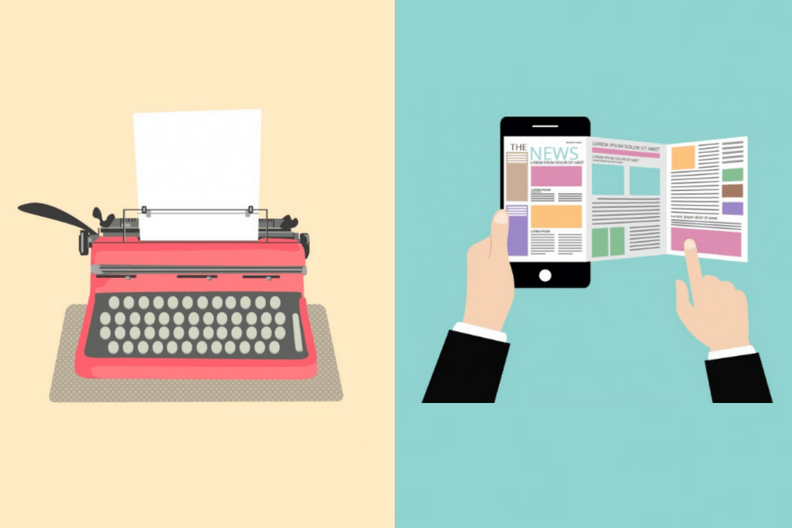 Have online websites become the future of journalism? Let’s find out! 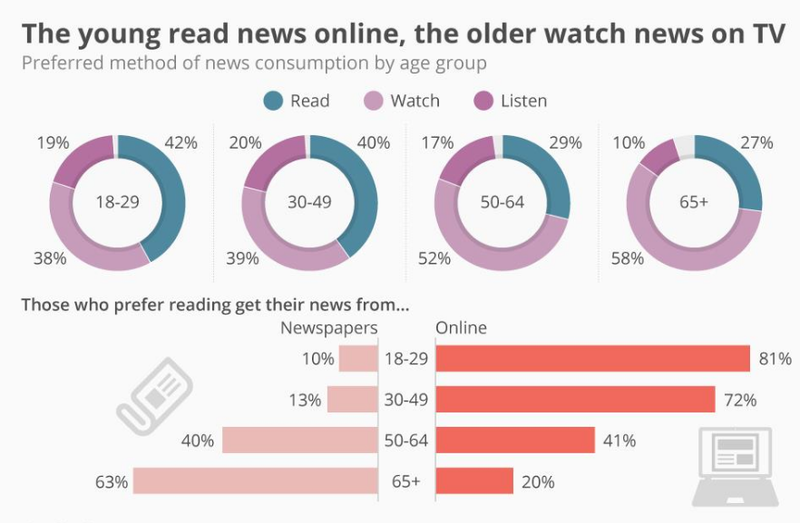 Why Do People Read News Online? In the last decade, journalism has entered a stage in which news organizations are less reluctant to invest in online operations. This is because of the fear that the internet will replace traditional media in the news market. Newspapers, however, are trying to combat the diminishing reader interest by shortening stories, adding commentary, and most notably, using social media to their advantage. Online news mediates informational and social experiences through a multi-media, interactive, hypertextual interface. Information is presented in text, audio, video, and images; social awareness and participation are encouraged via links to recommended and related content and space for readers to express their opinions about articles and issues. 70% of online news users had visited news sites a few times a day, while 47% of them would go to the internet first if they found out something interesting had happened. 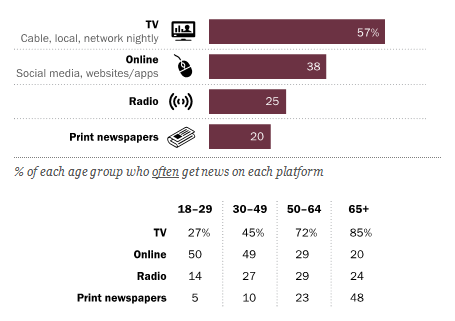 Online news media has been the only medium that has seen growth year-over-year; from radio to television to newspapers and magazines, every other medium has been through a decline in audience. Especially, after The New York Times admitted that print’s days are numbered, it’s pretty much a long, slow and painful downward spiral to the point that the newspaper, like the vinyl record, is a relic for collectors and anachronists. News organizations all over the world have in recent years increased their use of analytics – systematic analysis of quantitative data on various aspects of audience behavior aimed at growing audiences, increasing engagement, and improving newsroom workflows. User engagement is defined as a quality of user experience with technology and is a suitable construct for exploring interactions with online news. It purports to be a holistic framework that takes into account the characteristics of systems (e.g., usability, aesthetic appeal, interactivity), users (e.g., a level of felt involvement, positive effect) and what happens when these two entities meet at the system interface. Features such as selecting articles that have been recommended by other readers, following links within stories, and examining the comments of other readers make the user experience on the website more engaging. Although there is still a smaller core of loyal and frequent visitors to news sites, who might be called “power users.” The kind of people who return more than 10 times per month to a given site and spend more than an hour there over that time. It’s interesting to know that even the top brand news sites depend greatly on “casual users,” people who visit just a few times per month and spend only a few minutes at a site over that time span. The search engine, Google, accounts on average for 30% of the traffic to the major news sites which clearly means that people still use Google mainly to get their information. 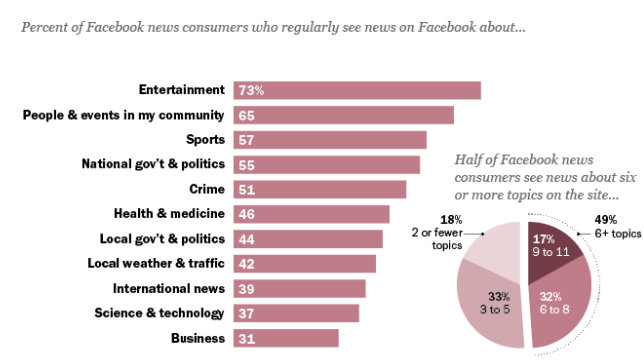 Social media, however, and Facebook, in particular, are emerging as powerful news referring source. At five of the top sites, Facebook is the second or third most important driver of traffic. Twitter, on the other hand, barely registers as a referring source. News organizations might need a layered and complex strategy to develop one way to serve casual users and another way for power users. Usability continues to influence people’s level of engagement. The interactive components of news website designs feature prominently and allow an enhanced experience. The articles played a major role in sustaining participants’ engagement in the experience. Engaging content maintains user’s curiosity and involvement in the articles. News stories are viewed positively when they are looked at from a different perspective, or linked with seemingly unrelated topics together. The use of images and headlines draw people to the content of the articles. As their interactions with the news website designs continue, usability and the presentation of the information continues to contribute to their experiences, but the novelty or personal relevance of the articles also influences engagement. Disengagement occurs when users become frustrated trying to navigate through the news website design or when the aesthetic or interactive features of the website interfered with reading the news articles. When it comes to news website designs, the navigation system acts like a road map to all the different areas and information contained within the website. If the navigation is clear, visitors will stay and have a good experience. The menu structure guides people to what they want to find and what you want them to find. In a 2015 study conducted by WhiteHat Security, it was reported that 86 percent of all websites contained at least one serious vulnerability, if not more. In that same year, Google reported that hacking had increased 180%. This makes security an essential feature on your news website. Integrating social media platforms into your news website will help boost your SEO, improve your business’ footprint on the social web and build your following across numerous social platforms. “Social media is not going to leave us anytime soon and it’s worth the investment in time – it does make a difference,” says Mills. A slow site is frustrating, one that fails to load is obnoxious and both could turn off customers. Reliable web hosting is an important part of building a website. Downtime refers to moments when your website is inaccessible to online visitors. These times can last for a few seconds or several hours. Choosing a reliable web hosting company means little or no down time. Here’s what we have to say about Web Hosting: What Is Web Hosting & Everything You Need To Know About It! White space is one of the most overlooked and underutilized elements that makes up a great web layout. One of the most important advantages white spaces provide is that they increase content legibility, and for content-rich news website designs this is very crucial. Loading all your content onto the front page or even having a welcome page with a pull-down menu of options can overwhelm your visitors, instead, keep your site clean and organized. Information overload is a huge roadblock for content-heavy websites and can be avoided using a few smart web design techniques, such as implementing ample white space and using boxes or borders to categorize information. If you give people massive blocks of information, chances are that 99 out of 100 people won’t bother to read it. Why? Because most people are inherently visual thinkers, not data processors. Design is all about visual communication. Photos and artwork are both visually stunning and unique, while still encompassing text-heavy content. Instead of bombarding your users with text upon first glance, let them explore your site using appealing graphics, and discover your content on their own. If you take the photo approach, make sure you use high-quality photos (and optimize them for the web) for the most success. How To Get Your News Website Design There? People don’t usually read online — they skim. Visitors spend 2.6 seconds skimming a website before focusing on a specific section. News website designs can be intriguing to examine. Regardless of what type of news they cover, they all face the challenge of displaying a huge amount of content on the home page, which creates plenty of layouts, usability and navigational challenges for the designer. The most important aspect that online news practitioners should focus on is providing continual 24-hour news services. People expect, along with continuous updates, quality content as well – 90% of online news users have clicked on links for in-depth and background information.The ability to combine news with other online purposes, on the other hand (email news alerts, the embedding of news into nonnews sections of portal sites) seemed to be extremely important for online news users. Monetization is also a major factor for news websites, and it’s interesting to see how they integrate advertisements in the design. In some cases, the ads are somewhat intrusive or excessive, but most news website designs are able to append ads without turning readers away, in part because of the content that’s available. Take a look here for more news website design trends! Newsmag is a sophisticated and fantastic looking WordPress theme that allows you to easily write and publish articles and blog posts. This template is one of the most wanted news themes on Themeforest. Its strong points are flexibility, performance, elegant design, retina ready layouts, unique demos, integrated translations, intelligent ads system, and all these come with no need for coding skills. Newsmag is Google AdSense ready and supports responsive and mobile-friendly ads. It is also optimized to work with WordPress SEO by Yoast plugin. Compass is a potently pliable, fresh-faced, bold and beautiful WordPress responsive multi-purpose theme, which while entirely capable of handling the needs and requirements of an ample range of different websites, is uniquely well suited for the design and construction of news and magazine related websites, online magazines, webzines and similar projects. Compass allows you to create magazine websites, completely branded to your image and superpowered by the Jetpack plugin’s incredible added functionalities, including Tiled Galleries, Related Posts features, full tag and much more. NewsPaper is a smooth and responsive WordPress theme ideal for content-rich sites. Its user-friendly interface lets you hover over an option to see a screenshot and click to see a demo. Its mega menu gives oodles of options to create the site how you want it. Its smart design is optimized for speed, AdSense, and Search Engine Optimization. NewsPaper is packed with usable features like an author box for your contributors, a brand’s section, multiple post layouts and a popular categories section. This theme was designed for magazines and other online publications, so it can fit great for your needs. It’s a clean and engaging theme with a flat design and increase responsiveness, which makes it ideal for cross-device accessibility. It’s also cross-browser flexible, loading and functioning perfectly on any browser out there. Best is a theme optimized for SEO and you will have an easy time ranking higher in Google with its SEO features. Herald is a high-quality WordPress theme for users who wish to create tech news website designs. It is a carefully-crafted product which boasts a broad spectrum of useful features. Although it is highly versatile and it can be used for a variety of roles, Herald remains tailored for magazine and news platforms. The setup process is accessible and intuitive. The theme has a completely modular header area, and it is possible to implement a header that perfectly matches your website’s theme. Without a doubt, this site knows who they are and reflect their parent products’ brands. 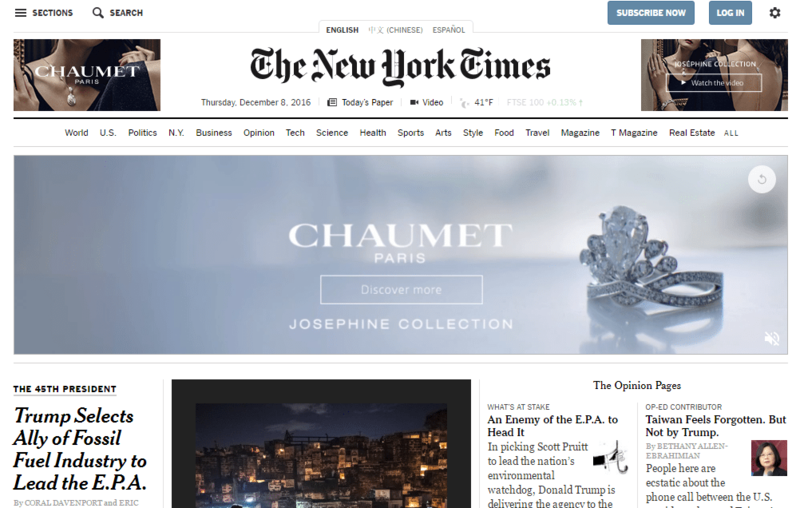 The New York Times has had a presence on the Web since 1996 and has been ranked one of the top websites. The website had 555 million page views in March 2005. The New York Times was made available on the iPhone and iPod Touch in 2008, and on the iPad mobile devices in 2010. It was also the first newspaper to offer a video game as part of its editorial content, Food Import Folly by Persuasive Games. CNN launched its website, CNN.com (initially an experiment known as CNN Interactive), on August 30, 1995. The site attracted growing interest over its first decade and is now one of the most popular news websites in the world. In April 2009, CNN.com ranked third place among online global news sites in unique users in the U.S., according to Nielsen/NetRatings; with an increase of 11% over the previous year. The depth of content of this news website translates well on the homepages. The newspaper established a website in 1996. In 2013, the newspaper announced that it had plans to start charging frequent users of its website, with many exceptions (such as for government employees browsing from work, and for students browsing from school). The Washington Post invites 9 million users from across the country to connect with critical information and events and to engage in conversation with other users. Great design and a structured layout are what makes this website feature in the top 5 news website designs for 2016 – The Webby Awards. In September 2012, Quartz officially launched its website, qz.com. Quartz is a digital-only publication that will be “mobile-first and tablet-focused with a responsive design that is optimized to fit any device.” Quartz is hosted on WordPress.com VIP Cloud Hosting that can then be accessed across all platforms. There may not be a “best” out there, some sites do better things than others with design, content, rating, and more. Most news sites have to please so many interests in an effort to try to be profitable that their identity is lost. Who they are, what their mission is, and who their readers are is difficult to distinguish. Findings suggest that there are several groups of news consumers online, each of which behaves differently. These differences call for news organizations to develop separate strategies to serve each audience better. Whatever the future of journalism, much of it depends on understanding the ways that people navigate the digital news environment. People want both permanent updates and comprehensive news, an expensive combination, considering that most of them are unwilling to pay for online content. For more info on News website designs and how to improve them, read SEO Guidelines for News Websites: How to Gain a Competitive Edge.